Heavy snowfall caused an avalanche in Wyoming. Snow tumbled onto a highway in northwest Wyoming, damaging one car but not injuring anyone. 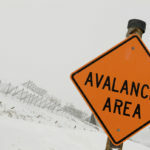 The Wyoming Department of Transportation says an avalanche occurred around noon Wednesday and sent snow onto U.S. 89 just south of Jackson. Dawn Dunlap, of Jackson, told the Jackson Hole News & Guide that her car was hit by the avalanche. Dunlap says she initially thought her car was a gust of wind but soon feared she was going to end up upside down. WYDOT officials say the avalanche may have been triggered by wildlife. Crews had the roadway cleared a little over an hour later.